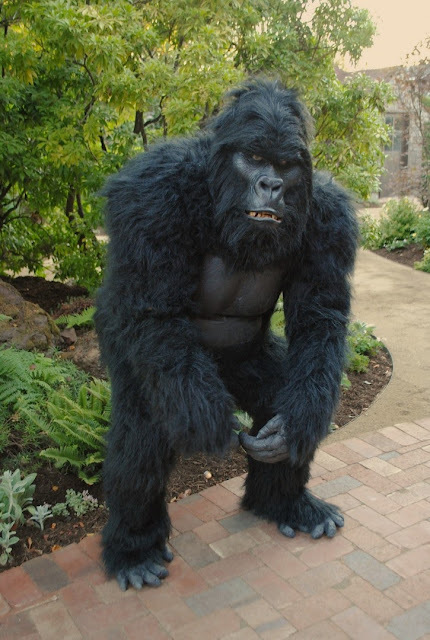 Hollywood Gorilla Men: Chris Walas's Build-up Gorilla Bash...The FINAL chapter!!! 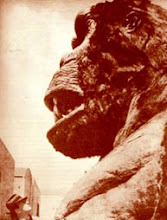 Chris Walas's Build-up Gorilla Bash...The FINAL chapter!!! This has been one hell of a great run ! Hopefully we've all gained the skills and know how to, if not build a suit outright, to make pro quality modifications to your existing suit. It's been a fun little diversion putting this suit together out of leftovers and Craiglist finds. 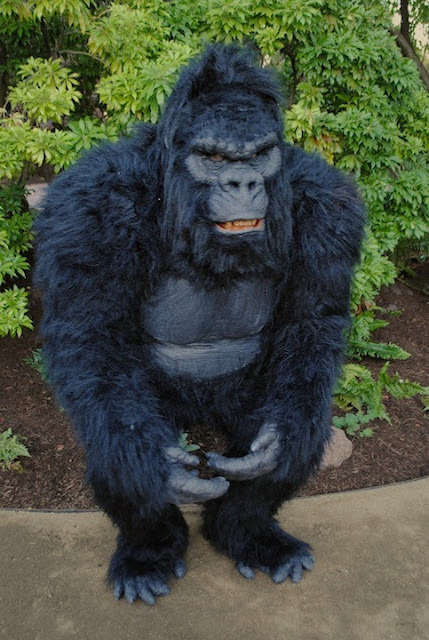 While I didn't wind up with a world class gorilla suit, Mogo will be great for his intended use; intimidating goofy hand puppets in a silly web series. I won't be covering the next phase, Mogo's suit of armor, as that's probably outside the realm of this site and also because I don't think I'll get to it for a while. 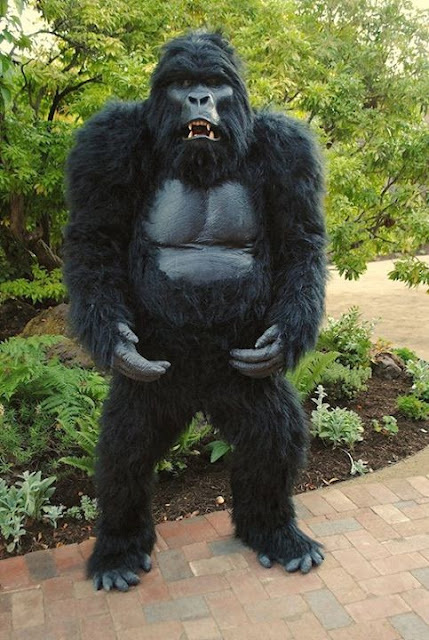 I did this suit using these particular techniques and approaches for two reasons: I needed a goofy gorilla suit and I didn't have the money to do it right. A quick glance back tells me that I only spent about $50 out of pocket, but that's only because I had or scrounged almost all the materials. A quick guesstimate of what you would pay if you had to buy all the materials would be around $700 more or less. If you used the materials I mention below, you can probably double that number. 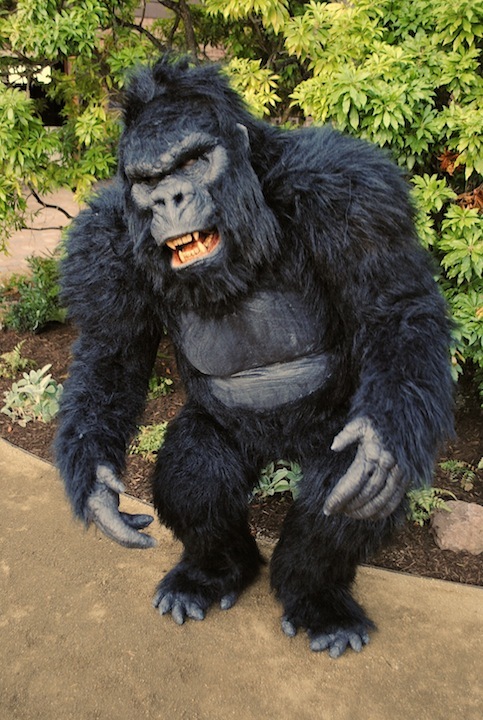 Still extremely cheap compared to a film quality construction where the fur alone would likely be $4,000 or more. -Make sure you have plenty of good ventilation at all times. Glue fumes are horrible and faux fur sheds fine hairs that go down your throat. -Have a good heavy duty vacuum on hand and use it often. I was vacuuming at least four to six times a day trying to stay ahead of the shedding fur. -I glued a lot of this suit together, mostly due to time constraints, but sewing as much as possible is preferable. It's more time consuming but it's also less toxic, lighter and less stiff than gluing. 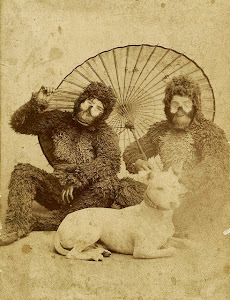 -Buy the very best fur you can afford. 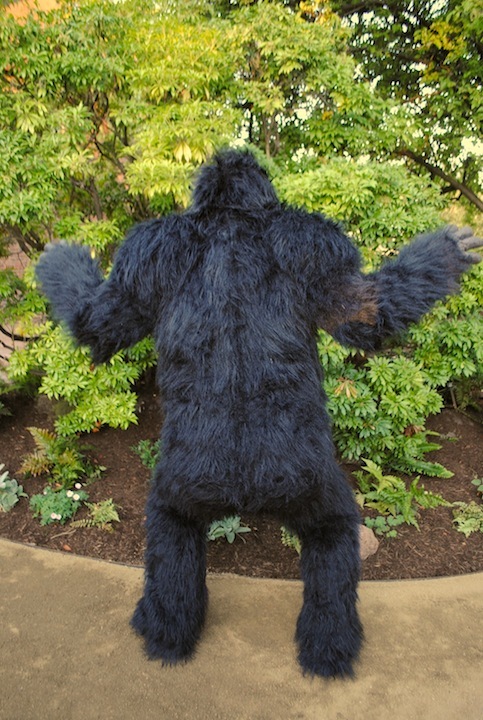 While I think the fur on this suit doesn't look as bad as it probably should, there are much, much better furs out there that will give you a far better look. -Better padding. If your budget allows, avoid the standard upholstery polyurethane foam that I used. It's hot and tends to be stiff, which can wear you down more quickly when performing in the suit. I did it to prove a point to myself about how cheaply I could do this, but I would much rather have used open cell foam. This is a more expensive foam that can be found under names like Fast-dry Foam, Quick-Dry Foam, Dry-fast Foam, etc. It's used a lot in exterior pillows and such. As it is open cell, it allows more air to move more freely than regular polyfoam. It compresses more easily and is also lighter. Another option is regular polyfill in sewn padding, which is a technique Chris Casteel will be covering in his great "cheap suit conversion". - Start with a unitard. They're cheap and can be had for as low as $30. The suit will fit better and be easier to do the construction on. -If possible, use a head cast of the performer and a good duct tape dummy of the same. 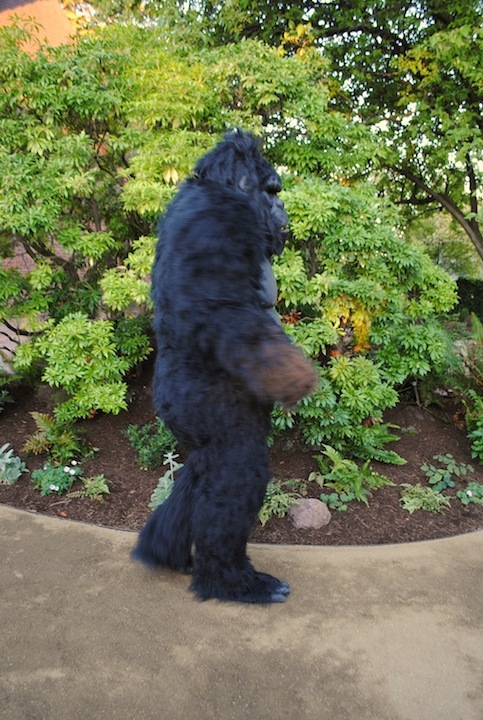 The more accurate the basic form, the better the suit and head will fit and work. -Take your time. If you haven't done any build-up before you may want to do a test patch somewhere first to get a feel for it. I find build-up to be fun and relaxing and I think it works exceptionally well for certain purposes, but it does take time. -Buy or make a chill pack vest. These are available online or you can easily make them yourself with cold-packs. They will allow you to stay in the suit a lot longer and a lot more comfortably. -Have fun. Really. Just have fun. Build-up is very forgiving if you make mistakes. Just cut away what you don't like and try again. You'll love it. 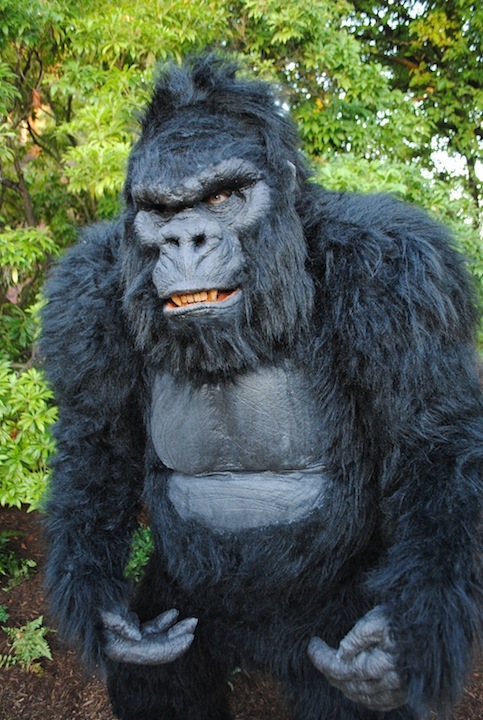 So ends my Gorilla build-up suit series. I hope some of you enjoyed it and I hope that maybe one or two of you out there might actually find it helpful in building your own suits. Oh, and one more thing. 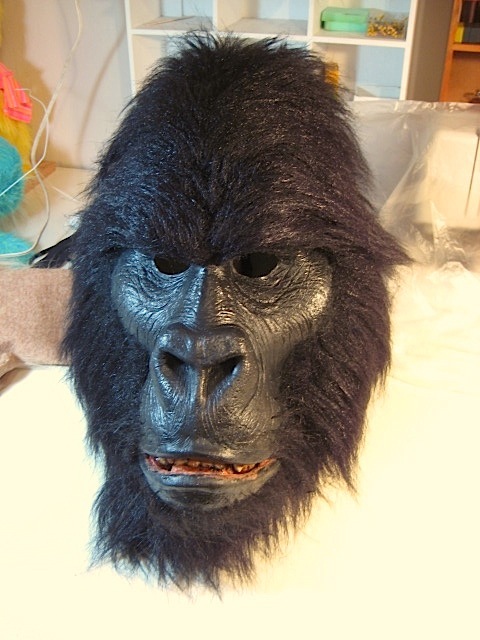 I can't remember if I mentioned it earlier or not, but amidst Mogo's construction I got so "gorilla mad" with all the great conversation on the FaceBook Ape Suit Cinema page and emails between Chris Casteel and myself I decided to do a quick sculpted gorilla mask as a sort of more regular head for the Mogo suit. It's inspired by my gorilla man hero, Charlie Gemora, and while it's not a copy of any specific Gemora head, I was definitely going for some of the great feel he had in his designs. And while the suit doesn't really fit with the head all that much, I think it still looks just fine and I'm amazed at how decent this really bad fur can look! I hope you enjoyed this series as much as I did and thanks for tagging along. 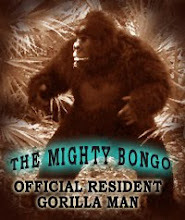 On behalf of Gorilla Man and myself (Bongo), Thank you so much for your amazing work Chris ! 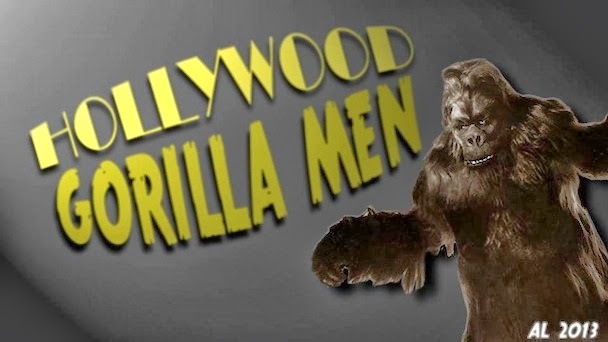 As a member of our Hollywood Gorilla Men family, your amazing simian exploits will be followed intently on this humble blog...Thanks again my awesome gorilla brother! Can you please repost part 9 of the series (feet)? It disappeared at some point, probably when the site rolled over to a new page. Thanks! Most impressive. Thanks for the chill vest suggestion. Excellent job. I think it looks superb. Wish I had the time, patience, and creativity Amazing suit for the cost and what you had on hand!